For 200 to 2000+ HP applications, these filters feature unmatched flow, easy installation & maintenance, and impeccable machining. 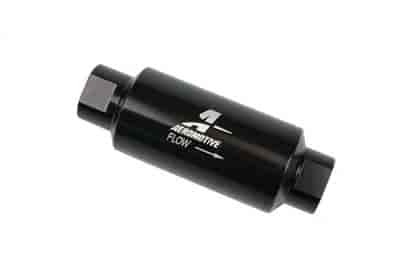 With several new products introduced, Aeromotive has come to offer one of the broadest and finest selections of performance fuel filters, including a Platinum Series with a show-quality finish. Keep filters clean for maximum fuel pump performance and life! Fabric elements require annual replacement or more often as needed. Stainless steel elements should also be cleaned or replaced annually. Note: Stainless filter elements are good for use with all fuel types. Fabric elements are designed for gas and diesel fuels only. Micro glass is for E85 and alcohol fuel applications. JEGS 15004 - Billet Fuel Filter Mount 2" I.D.